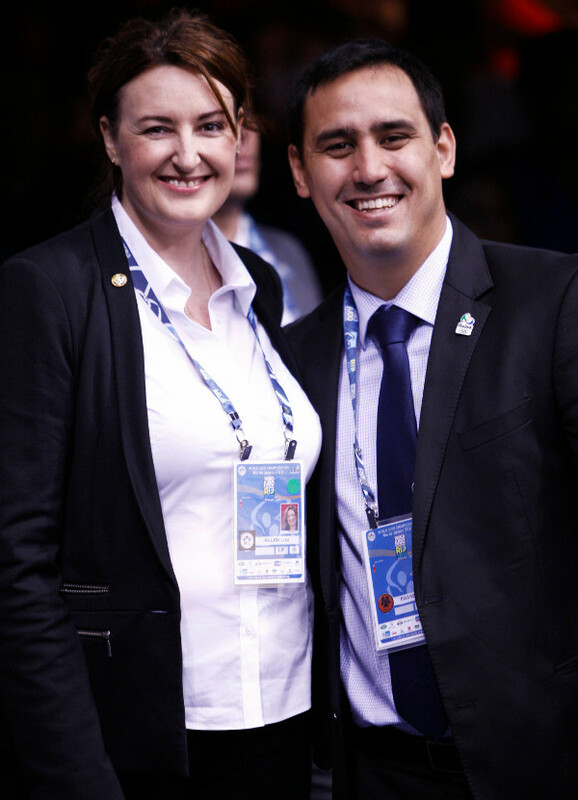 The 2013 World Championships continued to deliver some incredible moments of majestic judo and emotion as two judoka claimed their inaugural senior world titles at the Maracanazinho on Thursday. 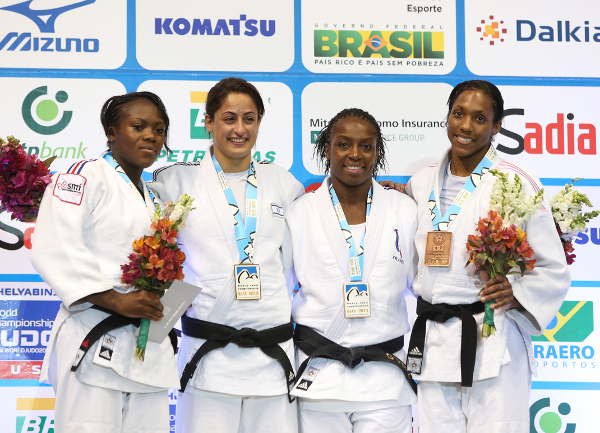 Two more winners were crowned on day four as the women’s -63kg and men’s –81kg judoka took to the tatami. The capacity crowd saw 47 women and 73 men compete with World Championships honours in their sights and a place on the most important medal podium on the World Judo Tour. Mr. Kenji SAITO, Rio 2016 Olympic Games Judo Manager, discussed Wednesday’s highly-successful visit with his Rio 2016 colleagues and organisers of the London 2012 Judo competition. Mr. SAITO said: “We had an amazing visit yesterday with a lot of people from different professional areas. I will manage the sport part but we had representatives from transportation, food, protocol and other departments all present. France got off the mark on Wednesday with Olympic bronze medallist Ugo LEGRAND (FRA) claiming -73kg silver and hit the medal trail today with four medals on day four. After four days of competition, Japan remain top with six medals including three gold ahead of surging France and hosts Brazil. World number one Yarden GERBI (ISR) and world number two CLARISSE AGBEGNENOU (FRA) were on an inevitable collision course from the outset as the two outstanding talents in the category this year. GERBI went ahead with a yuko from an o-goshi and after a moment’s pause she moved into ne-waza and worked her way into a position to catch the French ace with shime-waza from which there was no escape for the 20-year-old European champion. GERBI defeated ABE Kana (JPN) with a ruthless piece of shime-waza in the semi-final while at the same stage AGBEGNENOU had prevailed against teammate and two-time world champion Gevrise EMANE (FRA) with a harai-goshi earning ippon. The first bronze medal was won by veteran EMANE against 23-year-old European bronze medallist Tina TRSTENJAK (SLO) who had Urska ZOLNIR (SLO), Olympic champion at this weight, coaching her matside. The Slovenian walked into a seoi-nage for ippon on the edge of the competition area as EMANE showed her quality by winning the fourth World Championship medal of her outstanding career. The second bronze medal was won by 2011 World Championship bronze medallist Anicka VAN EMDEN (NED) who bested World Judo Masters winner ABE Kana (JPN). VAN EMDEN broke the deadlock by scoring a waza-ari from an ippon seoi-nage before slowing down and earning a shido for passivity. ABE backed off and both judoka received a shido for passivity but that completed the scoring and infringements as the Dutch judoka won the Netherlands’ second medal of the competition following the -73kg bronze won by Dex ELMONT (NED) on Wednesday. EMANE said: "I came here for gold but I’m not disappointed, I’m again on the podium at a World Championship. The changes in the rules were difficult for me, I had to adjust. I don’t feel like retiring at all. I don’t know what the future holds but I really enjoyed today and I’m happy for Clarisse earning a silver medal. For me it was definitely like a transition today between two generations. I’ll be competing in the future but its difficult to say when and how at the moment but I still feel really good." Junior world champion LOIC PIETRI was at his mercurial best as he climbed to the top of the sport with a win against European champion Avtandili TCHRIKISHVILI (GEO) in the -81kg final. TCHRIKISHVILI, who won his semi-final with a juji-gatame against Olympic bronze medallist NIFONTOV, made the brighter start as he opened the scoring with a yuko as the resourceful Georgian countered a drop seoi-nage attempt by stepping off the attack and pushing his rival onto his back. European Championship bronze medallist PIETRI responded with a waza-ari before being penalised with a shido for a false attack. TCHRIKISHVILI attacked with new vigour and came close to scoring from an uchi-mata but failed to summon enough power to throw the determined Frenchman. PIETRI was in danger as the penalties continued to flow as he was penalised for not taking a grip and a false attack. However, he held on to his lead and jumped for joy as he left the tatami to the delight of his teammates and the French fans who have typically travelled in good numbers. 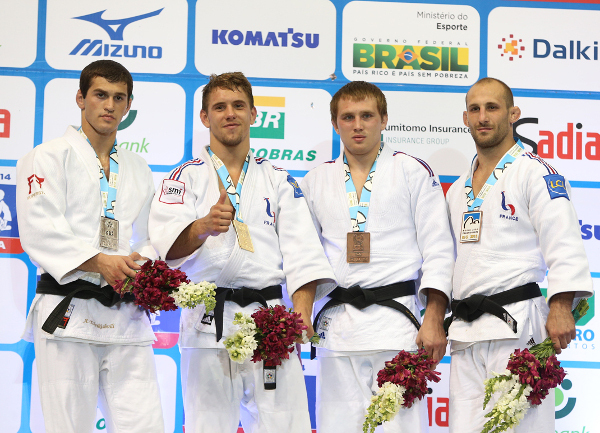 The first bronze medal was won by Moscow Grand Slam bronze medallist Ivan VOROBEV (RUS) who graced a World Championship medal podium for the first time as teammate NIFONTOV could not compete due to injury. The second bronze medal was won by the tenacious Alain SCHMITT (FRA) who produced a career-best performance which culminated with victory over Asian Championship bronze medallist Uuganbaatar OTGONBAATAR (MGL). 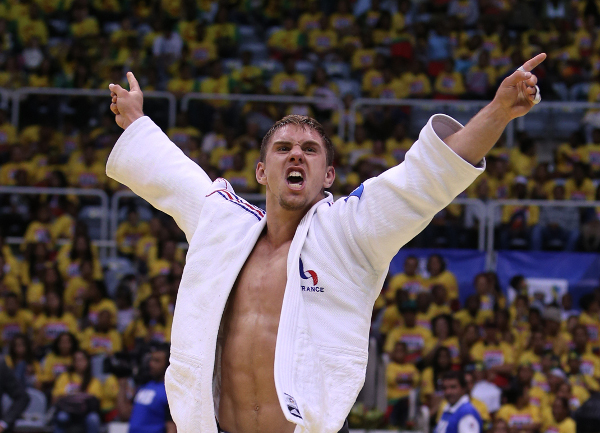 Baku Grand Slam silver medallist SCHMITT started well as OTGONBAATAR was penalised with a shido for passivity. The Frenchman drove forward and scored a waza-ari from a morote-eri seoi-nage to clinch the final place on the medal podium alongside teammate PIETRI. World number one Victor PENALBER (BRA) was humbled by eventual winner PIETRI in the Brazilian’s third contest to the shock of the home crowd who arrived at the Maracanazinho full of expectation. The story of the opening round was the surprise defeat of World Judo Masters silver medallist NAGASHIMA Keita (JPN) as he laboured to a premature exit against relative unknown Jesenko CETIC (SLO). NAGASHIMA was aiming to maintain Japan’s perfect start to the men’s individual competition as the table-topping team were three for three after TAKATO won the -60kg title, EBINUMA won the -66kg gold and ONO clinched the -73kg crown on Wednesday. The Paris Grand Slam bronze medallist was also striving to end a barren run for Japan in the -81kg category having never won a world title at this weight. The Japanese judoka was penalised twice for passivity while his opponent CETIC, who showed a steely determination, was only penalised once for the same offence. CETIC followed up with a win over PINEDA Felipe (Colombia) but bowed out of the competition after losing out for a place in the quarter-final against Marcel OTT (AUT).